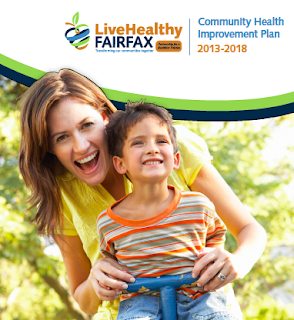 The Partnership for a Healthier Fairfax is "a coalition of community members and organizations that are working together to strengthen the public health system and improve community health." As a member of the Partnership, FABB participated in a series of meetings over the past year to help the Partnership develop the just announced Community Health Improvement Plan for 2013-2018. Thanks to those FABB members who spent the time to provide their input. The recommendations contain strong support for bicycling and walking. Fairfax should include health considerations as we become a more urban place. By creating a healthy environment in Fairfax more people will be able to use active transportation to get around. The first two "priority health issues" are "Healthy and Safe Physical Environment – Improving the community environment to support good health for all: Create a more walkable and bikeable community" and "Active Living – Increasing opportunities for physical activity to improve health." At today's Board of Supervisors meeting Supervisor Hudgins asked the Board to incorporate these principles in future development decisions. By doing so the Board understands that transportation is about more than just moving people and goods. It's also about quality of life and citizen health. Healthy and Safe Physical Environment: Health and wellness are shaped by the places where community members live, work, and play. The community environment, including homes, schools, worksites, parks, and streets, can be transformed to make healthy choices easy and accessible for all.1 According to the U.S. Surgeon General, people are more likely to engage in an active lifestyle when their neighborhoods are connected to safe walking and biking routes and they have easy access to public transportation and recreational areas. Creating a healthy and safe physical environment for everyone begins with developing and implementing policies that support community health. Active Living: Physical activity is essential to promote health and well-being in the community. People who are physically active tend to live longer and have lower risk for chronic disease, including heart disease, stroke, type 2 diabetes, depression, and some cancers. Physical activity can also help with weight control and mental health. However, not all adults engage in physical activity. According to a 2012 CDC report, 21.9 percent of Virginia’s adults reported that during the past month, they had not participated in any physical activity.4 For youth, the most recent Fairfax County Youth Survey showed that rates of physical activity decreased as student grade level increased.